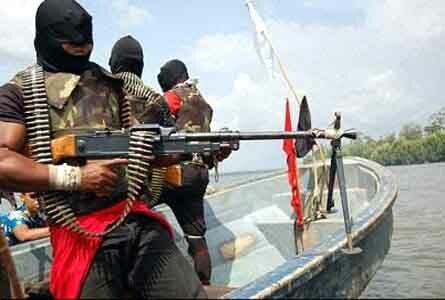 Hooded gunmen, clad in military camouflages, yesterday morning invaded Channels Avenue, Isheri, Lagos State and abducted eight persons.The victims, who are landlords at Oshorun Heritage Estate, had gone beside Lekki Gardens Estate with four others for their routine exercise. Lekki Gardens Estate is situated at the extreme of the long avenue, sharing a common boundary with the Warewa and Wawa creeks in Ogun State.It was gathered that about five minutes after they got to the exercise venue and were about spreading their mats, armed men, numbering about eight, surrounded them, shooting sporadically. While Kennedy Ucheagwu; Dr. Omololu Bello and Mr. Esang were whisked away by the kidnappers, Pius Ojoromi, Engr. Gbenga Babayemi, Banjo Obisanya and Coach Ola, it was gathered, fled upon sighting the hooded men. Ola was yet to be seen at the time of filing this report, causing residents to panic that something bad might have happened to him.They said the bushes the victims ran into were snake and crocodile- infested. The escapees, it was gathered, ran through the estate, scaling a high rise fence into a river where they stayed for about an hour. According to some workers at a nearby construction site, over 20 expended AK47 ammunition were picked and handed over to the police. One of the workers, Adamu, who conducted the Nation correspondent round the neighbourhood, stated that several window glasses and buildings were pierced by stray bullets. He said: “Those kidnappers stayed inside that bush. This is the second time in three months they have come out to kidnap people. “The first time they came, they took a man inside his house. But this morning, we noticed that two men stood at the end of road by the bush there.“When it was around 7am, we started hearing gunshots. Over 59 shots were fired. “The men wore masks and army camouflages. They just came to that place where landlords used to do exercise every Friday morning and kidnapped three. “As they were shooting, everyone ran away. I heard that they first caught one Mallam but they later left him that he does not have money before they went after those landlords. When our correspondent visited the area around 11:30am, the only police presence was a Rapid Response Squad (RRS) armoured tank by the pedestrian bridge on the expressway. Although residents confirmed policemen numbering about 40 were there in the morning, they stated the operatives left after three of the landlords who escaped came out of their hiding. Reliving the ordeal, one of the escapees, Babayemi, said the first thing that came to his mind was to flee. He added he just kept running until he landed inside the water. “We got to the exercise ground around 7:30am and about five minutes later, eight gunmen came from nowhere. “They were shooting nonstop. It is as though they were waiting for us. As they approached us, the three of us ran. I really don’t know much of what transpired there. “Myself and two others were just running. We ran into the bush and continued until we met a fence. “We scaled the fence and landed in the stream there. We lied down inside the stream for about one hour and refused to come out until we were sure there was police presence. “But about 30 minutes in the water. We started hearing siren from a distance. It was far and so, we still stayed in the water for some time. “It was about an hour when we decided to peep through the fence to know if they had gone. “When we peeped, we started hearing voices and some people told us that police were on ground. That was when we came out. He added: “Bullet did not touch any of us. We just sustained minor injuries like bruises and then one of us caught cold. We were seven in all.